Cyprus has always been my hat man. 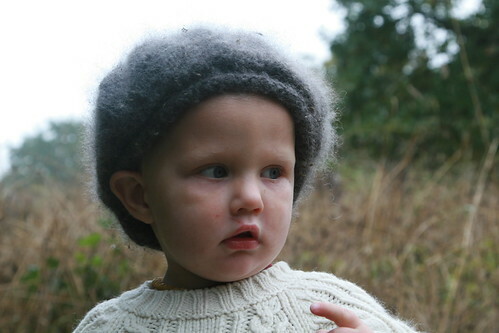 When he was born, even though he was due in the summer, I worked to make him a hat, and from the moment he was born until he outgrew it, that hat was on his head or near his head. It was made out of hand spun yarn that was mostly angora rabbit. After I was done with it, it had bloomed quite a bit and it was adorable. 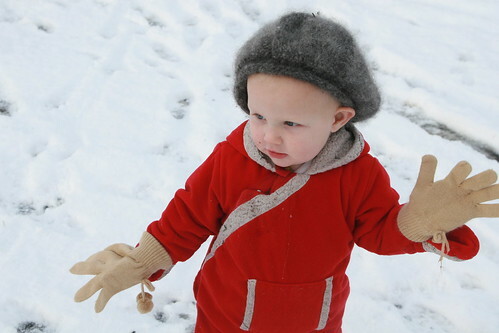 That hat has since been lent out and lost, but I remember it very fondly. Of course, not having a hat was unacceptable for Cyprus, so I pulled out the trusty spinning wheel and spun up some grey Shetland/Angora yarn that was to die for. I had also recently run into a hat pattern I couldn’t live without, so I spent a frantic week spinning and knitting a hat #2 for Cyprus. Technically, it was a matching hat, sock, pants set. The socks got good use and have since been outgrown. 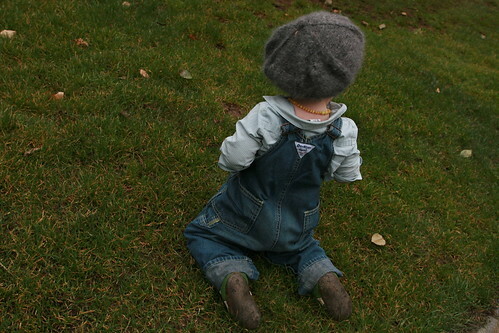 The pants have also been outgrown, so the only thing that is left is the hat. BOY does Cyprus love and appreciate that hat! 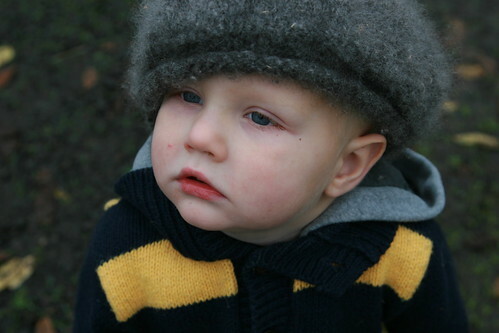 Young kids have a reputation of being hard to keep hats on, and they tend to lose them easily, but looking back through my year of photos, I see the many, many times the hat has warmed the head of my little man. 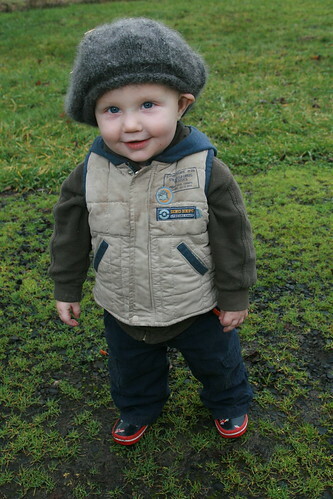 It kept him warm last winter while we were outside in the weather quite a bit trying to set up a farm. It did its job in the dead of winter when we received our only snow of the season and had to go out and play all morning. It accompanied him out to do the chores during the long, late spring. 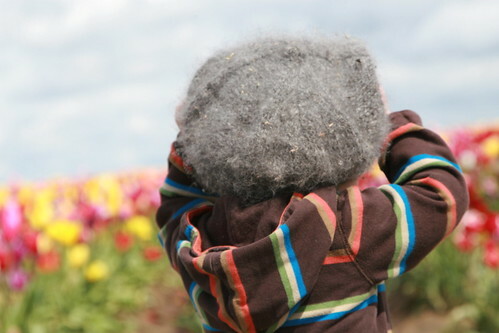 It kept the wind off his bald head while we explored the tulip fields. It made him look adorable at every possible opportunity. And, after a long summer break, it again made an appearance as we went out to explore some Pioneer Cemeteries for Halloween. And he has worn it almost every single day since the weather started to get cold. 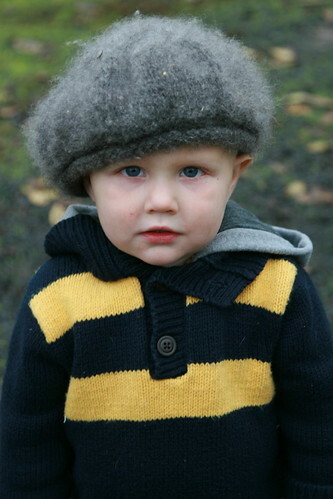 Recently, someone was asking me about using Angora in yarn, I asked Cyprus to grab his hat to show an example. He went and grabbed his hat and came running through the house shouting, “I’ve got my hat, there is rabby (his work for rabbit) in my hat.” He was so proud to show it off. 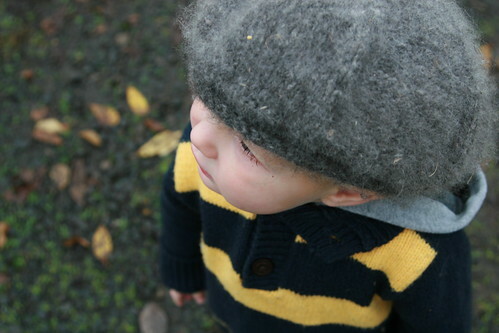 The hat now tells a story, it has a meaning for me, and it’s still a bit big, so I know it will continue on keeping my boy cute and warm for another few years before he out grows it and it is time to make a new one. This, folks, is why I knit. Yep, I’ve been a little MIA. Working on coming back. I have been trying to find my desk under all the garbage that made it onto it during the move. Almost there! Until then, I found this while clearning out photo files. This is my 3rd pair of socks made for Mr. Cyprus out of wonderful alpaca yarn. They are soft and warm, and he wears them EVERY day! I am HOOKED on sock making! I wasÂ pleasantlyÂ surprised to get a box addressed to the kids from some friends of Papa Bob. Â When I opened the box I almost died of excitement. Â They had sent Daphne a handmade sweater! Â I thought it was super cute. Â I even managed to get a photo of Papa and Daphne together while she was wearing the sweater. This is some yarn that I recently spun to make a sweater for Cyprus. The sweater is a little complicated, so the yarn has been sitting on the knitting shelf for a while, but you might soon see a sweater made from it. This is a merino silk blend that I traded for. Â It is gorgeous. Â Just hope I can do a good job with the sweater. I happened to run into this photo of the Grey Sliver yarn that I spun for the Longies I made for Cyprus. Â My spinning is getting much, much better the more that I spin. Â I am very proud of how much better this yarn looks than the last yarn. It has long since been made into longies, but I enjoy the photos I took of the yarn. I haveÂ been working a lot lately on my spinning and knitting skills.Â I have 2 of the best excuses in the world to spend my free time spinning and knitting (Daphne and Cyprus).Â I find it very satisfying to put Cypus in hand made items and take him out to be admired. My spinning has been getting much, much better recently.Â It is now viable for me to be able to knit garmets from my handspun wool.Â My first project was a pair of longies for Cyprus with a matching hat.Â I think they came out very well. 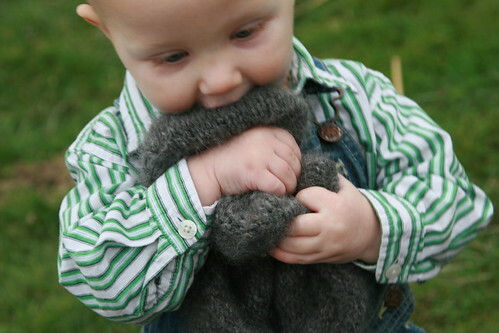 They are a nice natural sheep color, 100% wool, warm and soft *sigh* what a lucky little baby. The hat came out really nice. The proof is in the pudding, right?Â I think that it is an adorable set for an adorable baby. Apparently they are good for chewing on. The hat really works for him. While I was still pregnant, I got the bright idea to try to knit a hat for Cyprus to keep him warm when he finally made it into the world.Â I found a pattern and knitted away.Â The only problem was that the hat was HUGE even though it said it was for a newborn.Â I had to give the incredibly adorable hat to Daphne. I have been working hard on my spinning lately.Â I have been completely consumed with the process of growing bunny fiber, preparing it and spinning it into a usable item.Â It makes me so proud to think that I can grow, spin and knit items for my family. The first hat being too big left the baby hatless and gave me an excuse to try it again.Â This time, I was going to use fiber that I grew, dyed, prepared, spun and knit on my own.Â The hat was a sucess!Â I think that the blue color matches the blue of the Aegean Sea, which is a bonus being that my baby’s name is Cyprus.Â I adore and cherish the lovely hat.Â Also, the kids now have matching hats, which is pretty cool. Look at how proud I am of this hat. 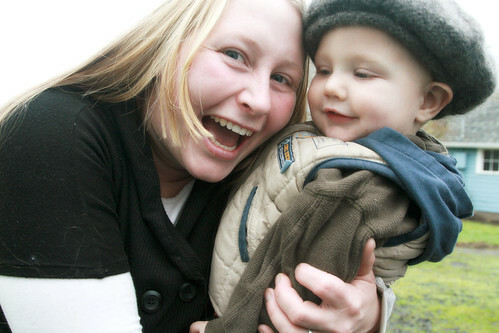 Seriously, is there anything more cute?Â It was totally worth all that work. I must say that I put the hat on him at every possible opportunity because I am just so darn proud of it. I am constantly telling people that I have few ideas of my own and that all my good ideas are stolen. The idea to make a sleep sack for my baby came from Julie, who thought it was an AWESOME idea.Â After looking around on the web I realized that it is a simple knitting project and that I could even make up my own pattern for it. About 9 months ago, in the dead of winter, I was taking Daphne to play at Scotty’s so that I could finish my sleep sack and have something for my baby to sleep and snuggle in.Â Fast forward, I now have a 3 month old baby to put in the sleep sack and a free pattern for you to do the same! Cyprus is adorable in his sleep sack. I really like how he can kick all he wants in it and still have it stay on to keep him warm. Of course, it doesn’t do much for his arm wiggles. I joined a knitting group during the winter with a few friends.Â We all get together every other Thursday to knit and talk.Â All but one of the girls in the group is either pregnant or has a newborn baby, so we have all been working to knit some nice soakers for our babies. I used the Curly Purly soaker pattern. The first one I knitted was the blue soaker. I actually knitted it with white yarn and then used food coloring to dye it after the fact. The dyeing went really well, and I am very happy with the color. Anyway, I love how they came out, and they are already getting good use. A few of my friends and I get together every other Thursday to knit and chat about life.Â I’ve been making diaper covers and other things so much lately that I decided to try something a little bit different.Â I decided to make my first hat!Â I made a nice stripped hat for Daphne.Â It goes really well with a specific outfit that I like to put her in often, and it just looks so darn cute.Â Unfortunately, I can’t seem to capture photos of it on her, but here are some static photos just so you can see the creation!Â Hats are lovely, and I definitely think that I will be doing more of them in the near future–in fact, I am in the middle of one for the baby right now that matches this one.Â The only difference is that the hat I am making now is made out of yarn that I spun from my very own rabbit hair!